The German industrial giant Siemens says at least two gas turbines it has supplied to a Russian company have been illegally diverted to Crimea. The firm said the turbines had been moved "against its will" and in breach of EU sanctions imposed after Russia's 2014 annexation of Crimea from Ukraine. The Kremlin said the turbines had been made in Russia using Russian parts. Russia's Energy Minister Alexander Novak said installation of the power turbines in Crimea would go ahead. Despite Siemens' protests, the project would be "implemented in any case", he said. The factory in St Petersburg, where the turbines are thought to have been made, is majority owned by Siemens, according to Reuters. The German company said: "Siemens has received information from reliable sources that at least two of the four gas turbine sets, which were delivered for the project in Taman, Southern Russia, have been moved to Crimea against our will." It added: "Over the last few months, our customer has confirmed to us numerous times in writing that a delivery to Crimea would not occur. "As a consequence, Siemens will initiate criminal charges against the responsible individuals." 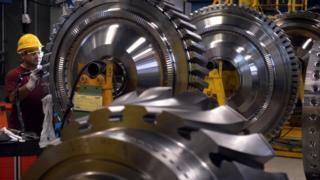 For its part the German government said it was up to Siemens to ensure it obeyed the EU sanctions and export laws. Siemens said the delivery of its turbines to Crimea was a "clear breach" of its contract and that it wanted the turbines to be moved back to their original destination.